How to remove the ban on your main channel? What's your username on YouTube? So, i finally got around to playing manhunt, and i'm in love with the environment, i was wondering, how's carcer city map looking so far? if i can ask, where can i see some progress pictures? Have you already checked out the YouTube channel for this project? Their last video mentioning Carcer City is from several months ago. After checking for a while, the progress pictures are concentrated more into the 638th-667th pages. It could take a week or two until the UG-MP livestream will be held. There are many vehicles and weapons in the style of GTA San andreas on this page are very good. Vehicles of GTAIII GTAVC GTALCS GTAVCS GTAIV GTAV and real life cars converted and redesigned in the style of GTA San Andreas. Pedestrian skins of varios category. Weapons of GTAIII GTAVC GTAIV GTAV And real life converted and redesigned to the atmosphere of GTA SAN ANDREAS. @Maverick512They're making the models themselves. Also, don't double post. Also RIL.Grading ft. colorcycle.dat atmosphere of the mobile version. @ Maverick512 Están haciendo los modelos ellos mismos. Además, no doble post. But have you visited the page? That is, the links I leave. 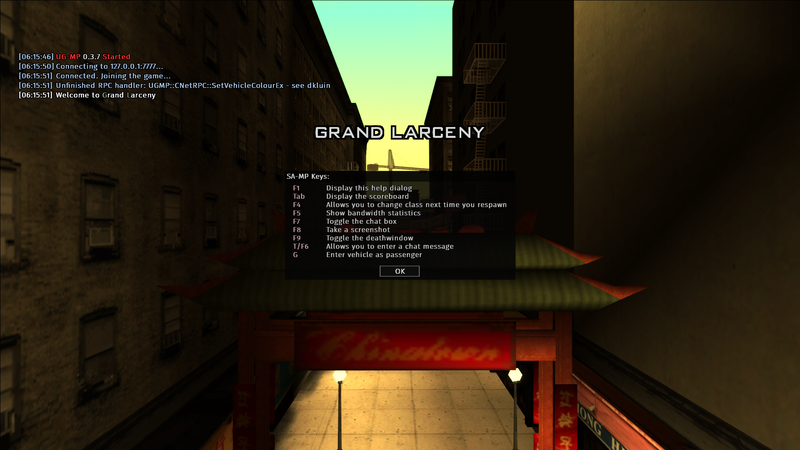 The models on the Libertycity.net page are very good or else I would not bother to publish it. Yes, I checked out the page, they do look good, but it's unnessesary for them to use models made by other users, because they already have modelers in their team. Ok it's fine, At the moment I'm downloading GTA: Underground Snapshot 3.3.10 - Standalone looks very good mod I think it has really good future. Hi, excuse me personally I do not like the PS2 effect of SkyGFX as I do to use the GTA Underground without SkyGFX? Hello Trolencio 900 links. Did you already use the (.ini) settings file for SkyGFX /? Have you updated your game to Snapshot 3.3.10.4? There is a folder dedicated to optional versions of mods that have been made compatible with GTA Underground. Install the debug menu and press Ctrl + M to open that menu. It will let you change some options for SkyGFX. If you have Snapshot 3.3.10 and you haven't updated it to Snapshot 3.3.10.4, your game will have incompatibilities with Project 2dfx, making the draw distance so low that the map doesn't even load next to you. If buying a plane ticket to Vice City or Liberty City, use the scroll wheel to see those options in the ticket machine. You can only go to one other city because the game crashes when players reach a third city, which limits you to two cities, but it includes your current city. This means that despite having added cities, this mod won't even let you explore all of San Andreas without the game crashing. The developer has called Snapshot 3.3.10 the worst update but instead of creating Snapshot 3.3.10.5, we will be left waiting for Snapshot 3.4, and the developers are prioritizing multiplayer. Click on the linked blue tag/white text on the top left part of this page that says "GTA Underground". Scroll down until you find and click on the FAQ thread. Read everything before posting any questions here. Don't forget to comment, like , dislike, subscribe, unsubscribe, and report, or I will cry like a little (you already know). Thank you fan of kickendo. By the way, where are you from?. No te olvides de darle like suscribirte en desuscribirte y denunciar o sino me pondre a llorar como una puta ya sabes xd. Didn't follow this for quite some time, where can latest progress be seen? I think I seemed to see in the ReadMe.txt file something about how to get to the moon someone can help me. Anyways, the moon thing consists of typing BEAMMEUPSCOTTY but it only teleports you to a gray empty land with a black sky, which means that there is nothing too interesting about it. You're better off flying to that one studio in Prawn Island, Vice City. Should we message each other to keep this thread clean from repeated posting? Also, it may at first seem rude but my questions are actual questions and not some kind of insult. Will UG-MP be the biggest focus for Snapshot 3.4? Are you all still fine about having Snapshot 3.4 rather than Snapshot 3.3.10.5? Will UGMP have stunt and zombie servers? Also could i run the game smooth with a E8400 Intel CPU and GT 1030 with 2 vram ? Yes, that's exactly what I'd like him to do, to be inspired a little bit by the menu of Gta 4 complete edition. Countryside seems incredibly unfeasible if not impossible in terms of the time required to create something as 'decent' as our current plans for Upstate Liberty, which involves custom cars, peds, weapon stores, safehouses (which would then need their own interiors) and the like. This is because of the lack of people which are capable, motivated, and have the time to help, and we probably won't start even attempting countryside until Midway and Upstate are complete. Such an 'attempt' will probably involve connecting Bullworth with Upstate with countryside. The terrain would transition to a Bullworth-ish one from the more SA-ish one seen in Upstate. After this is finished, we will decide what to do next. An idea I have on how to deal with roads leading to unfinished areas (which wouldn't be included) is by either blocking them off, or not adding these roads in the first place. This is how R* did it. Keep in mind that modeling an entire city or just countryside between cities isn't just 'done in a week', we're talking about a year at best. The 'attempts' mentioned above are not plans; they are speculations on what I think would be done. Can you post this comment on suggestions topic please? Lol, what about adding half life2's city 17 and call of duty's normandi coast?? What I am trying to say is that filling the mod with other cities from other various games is sort of awkward, due to the fact that the games' sets differ. Don't get me wrong but you got to understand this, there are too many possibilities and choices if this thing gets into consideration and sometimes can be a pain in the arse for devs to add these cities and maintain game stability at the same time. Unless the cities you're talking about fit in the game which is something beyond my control. Indeed it is a great mod,my friend! I hope it's not much to ask, but can i run this mod with a GPU GT 1030 with 2GB vram and E8400 CPU?